Instructions: Fold a letter size length wise in half, then on the top half you part it in 3 pieces, cut them in to the fold line. Fold the middle part in half, fold the side parts in a diagonal from the outside upper corner to the downside left corner they are all Mountain folds. Cut a piece of 4 x 4 ½" of kraft and glue it on the middle piece, just on the bottom part of the fold. Then cut and adhere designer paper on all the parts of the card also on the bottom. Distress and ink all the edges with Vintage Photo. Glue a ribbon on the bottom part and next to it a piece of bling on the roll. Die cut 2 lattice pieces from the Window Box Elements die out of kraft paper, using a scissors cut them in half. Use one piece on the bottom and glue a piece of the rose ribbon on top. Now glue one piece on the middle panel and the other 2 pieces on the side panels. Die cut a circle from designer paper with the Biggest Small Circle die, and two pieces with the Festive Holiday die. Then die cut the image with a smaller circle die. Arrange these pieces as shown and glue the whole thing on the middle panel. 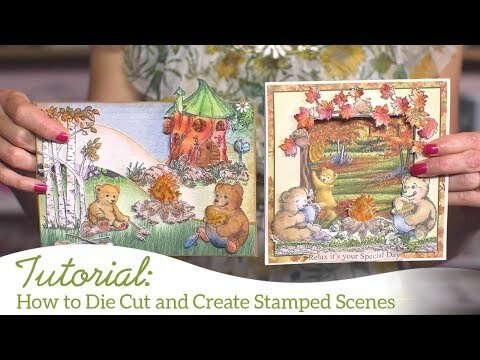 Stamp, color and die cut the bear using Vintage Photo ink on white cardstock. Give him a little bow and glue him on top of this all. Now stamp, color and cut the leaves and flowers from white cardstock and decorate your card with them at your own taste. I stamped and colored the flowers in Picked Raspberry ink. I stamped the leaves in black ink and colored with Memento ink. 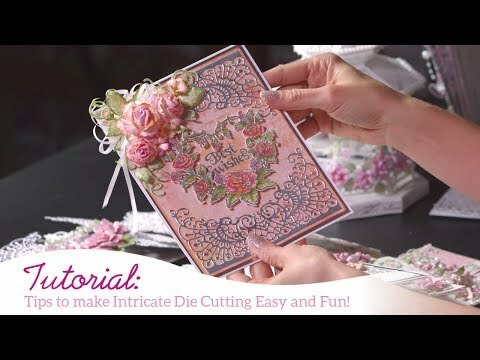 Die cut with coordinating dies and shape using the Deluxe Flower Shaping Kit. Adhere onto card as shown. Using the pearl pen, make some dots on the leaves. Tie a bow with the tulle and add a charm on top of it, glue it on top of the middle panel. Glue another charm on the bottom of the panel, and put some Crystal Clear on the Image.